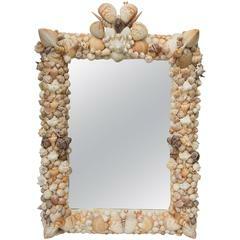 A fantastic free-form sea shell and bronze mirror. You can hang it in three different ways, France. 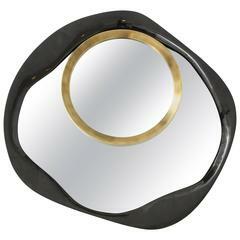 Decorative large mirror designed in two-tone shagreen, black sea shell and bronze. Delivery time 12-14 weeks. 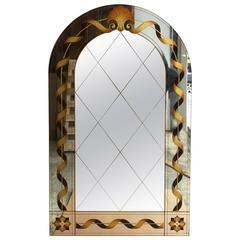 Decorative large mirror designed of shagreen, mother-of-pearl, black sea shell and bronze. Decorative box made of black sea shell and bronze. Mirror completely covered in Abalone sea shells. Exceptional handiwork and scale are the hallmarks of this large antiqued mirror in a meticulously constructed sea shell frame, circa 1970s. 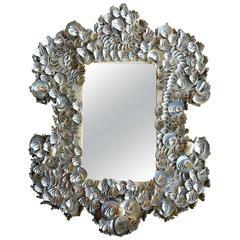 This is a fanciful shell art rectangular frame encompassing a mirror plate, 20th century.